Sega's Wappy Dog game for the Nintendo DS includes a toy robot puppy that interacts with the game software. You communicate with Wappy using commands given through the Nintendo DS microphone, and he’ll respond by wagging his tail or barking or making movements, which is meant to feel him like a real pet. There are supposedly more than 350 evolving responses. You’ll also need to keep Wappy happy, or he’ll turn uncooperative. Also, while Sega refer to him as “Wappy,” you’ll be able to give him whatever nickname you please. Wappy will go through five stages of growth, from puppy to adult. If you need to go on a trip, you can switch Wappy Dog into Travel Mode, which lets you take the Nintendo DS version of the dog with you, without the need for the physical unit. When you return home, you’ll be able to transfer your progress to the physical dog. 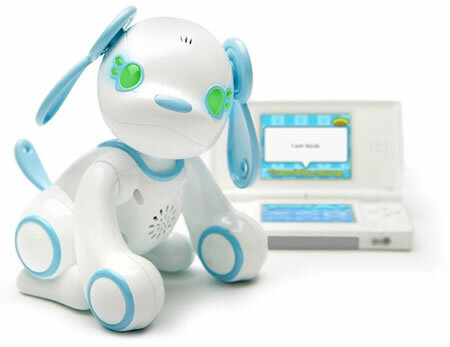 Fans of Sega's robotic dogs may also recall the unbearably cute Sega idog Robot Puppy from a few years ago. 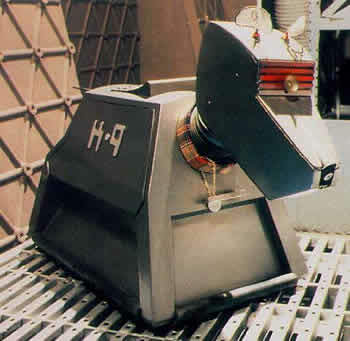 SF fans can't resist the robotic dogs; consider K-9 from Dr. Who. I'm sure you have your favorite.